O Christmas tree, O Christmas tree, how easy it is to inflate you. That's right, inside of this handsome 3-5/8" (9.2 cm) round x 4" (10.2 cm) tall tin is a deflated vinyl Christmas tree. 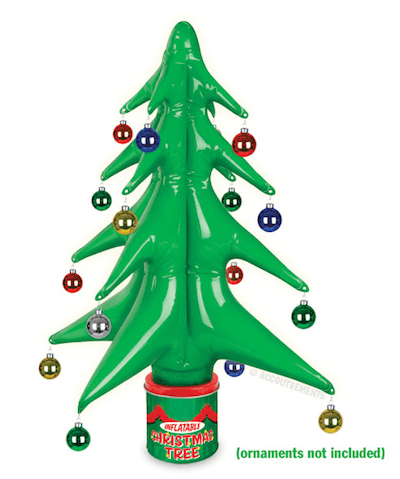 Just pull it out, blow into the valve and in the time it takes to sing the first verse of Jingle Bells, you'll have a fully inflated, 18-1/2" (47 cm) tall faux pine tree! It's a Christmas miracle in a can! Includes a magnet in the base to stand it on top of the tin and a hole on the end of each limb to hang ornaments. Ornaments not included.